Most people pass the german naturalization test. The success rate is 98.2 - 98.8% "Most people pass the naturalization test," writes the German newspaper. So that you can specifically prepare for the 2019 naturalization test and thus get the German passport, the app is available to you free of charge. 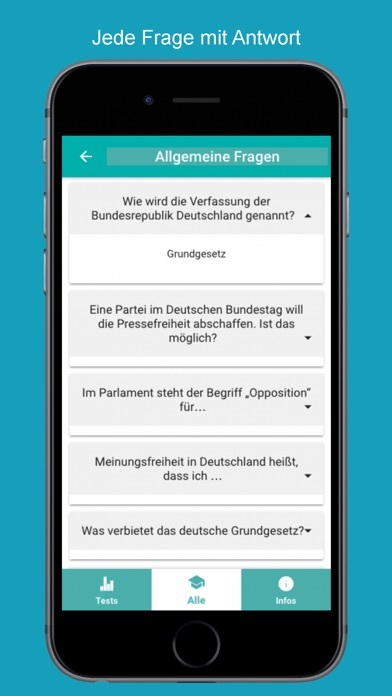 The app contains ALL basic questions of the official naturalization test of the Federal Republic of Germany. All questions are up to date, complete, user friendly and free. For each question, 4 answers are given, just as in the natural citizenship test. Of four answer options exactly one answer is correct. There are also tests in the app. 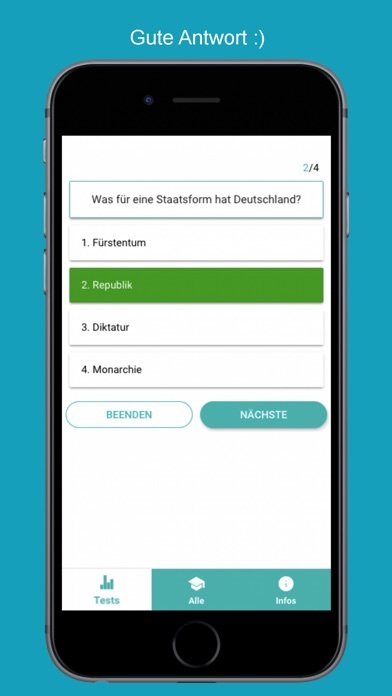 A test includes 33 multiple-choice questions about life, the current society, the rules and laws in Germany, as well as questions about the state by living. The test lasts one hour and you must answer at least 17 questions correctly to pass the test successfully. So the German Citizenship Test contains 33 questions from this app can get in the real naturalization test. "The success rate in the naturalization test has been stable nationwide between 98.2 and 98.8% for years" - according to the Handelsblatt. We wish you much success! The German naturalization test: Since 1 September 2008, foreigners in Germany must pass a nationwide naturalization test for naturalization. Since 2013, the naturalization test is called "Living in Germany". The German Citizenship Test contains 33 random questions about life in Germany. Of these, 30 are general and 3 are federal issues. To pass, at least 17 questions must be answered correctly within 60 minutes. The naturalization test is a prerequisite to be naturalized in Germany and thus obtain the German passport. The app is designed for smartphones and tablets.